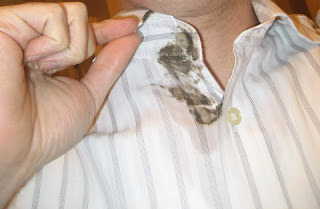 thickcrust.com: Calgary, what have you done to my shirt??!! After a ridiculous 14 hour trip to Calgary, I am here for a couple of days. I understand that winter brings travel delays, but I really need to remember to try my best to avoid Chicago airports. 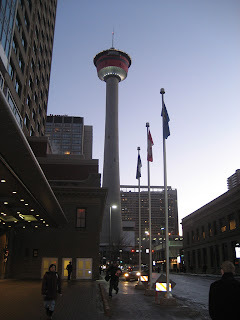 Throughout the 1988 Winter Olympic Games, a flame burned at the top of the Tower, making the Calgary Tower the World's Largest Olympic Torch. I imagine the Calgary Tower set ablaze was a horrifying sight. It is cold here (-9 C/15 F), but according to the Calgarians I've met the city is experiencing a heat wave. The last couple of weeks have been -20 C/-5 F. In any case, it is cold enough that the roads are icy and slippery. As I was returning to my hotel after work a saw a man fall down in a puddle of dirty, slushy water. His entire leg was drenched. At least it was the end of the day. I took his misfortune as a reminder that I need to slow down. It was very slippery, and my shoes do not have good traction as it is. While I feel sorry for the man, perhaps he can take comfort in knowing that his fall might have prevented my own. I walked to dinner very deliberately and managed not to fall. I even resisted the temptation to jaywalk despite an utter absence of cars at a couple of intersections. But as I waited for the walk sign, a lonesome car came driving by me. The next thing I know I feel two small chunks of snow land in my neck. The streets of Calgary spit on me. While I am annoyed that one of my favorite shirts might be ruined (I tried to wash my shirt in the sink in my hotel room, but I couldn't get the dirt out.) I have to admire the precision with which the snow hit me. It landed in a tiny crack of flesh exposed between the button of my jacket - I mean coat. It was the winter version of a hole-in-one. The man walking next to me was probably thinking, "At least it's the end of the day." If you had been wearing a scarf it would have deflected the slush-missile.